A wall is a physical barrier that obstructs, contains, and excludes. At their most benign, walls are structural elements that demarcate territorial boundaries and signify possession. My house is enclosed by walls. You may enter its doors only with my permission. In the political arena a wall can take on a far more negative connotation as part of an infrastructure of violence, an in-your-face assertion of border securitization under resurgent populist nationalism. In ancient times, the Romans and the Chinese built great walls against armed incursions. More recently the Berlin Wall was erected to keep East Germans in. Today, in a reversion to this old-fashioned yet extremely expensive moat and drawbridge mentality of national security, America plans to extend its current 700 miles of separation barriers all the way along its southern border from sea to sea to keep Mexicans out. Many Americans are not aware that one third of this physical barrier has already been built since the escalation of border security measures in the early 1990s. Referred to interchangeably as wall and fence, it may be fabricated from steel tubes, barbed wire, recycled railroad tracks, wire mesh and even upended Vietnam-era Air Force landing strips. Some segments rely more on high-tech surveillance systems such as blimps and drones, as well as motion and heat sensors. Whatever the construction material, the borderwall dominates and scars the landscape, incurring massive cultural, social, psychological and ecological repercussions. The wall is ugly—symbolically as well as visually. It is easy to see this kind of massive barricade as bisecting a whole into reified dualities. Here versus there. Us versus them. Legal versus illegal. But what if a wall could be seen instead as a piece of architecture that brings people together along a linear third space of borderlands that are more of a gradient that two sides? Viewed this way a wall could become a transformative process in a liminal space wherein the physical barrier becomes a porous membrane which connects this in-between place by its very divisiveness? A border wall could become a site of creative collaboration and active contestation in the articulation of a new identity politics that subverts the separating intent. This is what UC Berkeley professor and practitioner of architecture Ronald Rael challenges us to think about in Borderwall as Architecture: A Manifesto for the U.S.-Mexico Boundary. 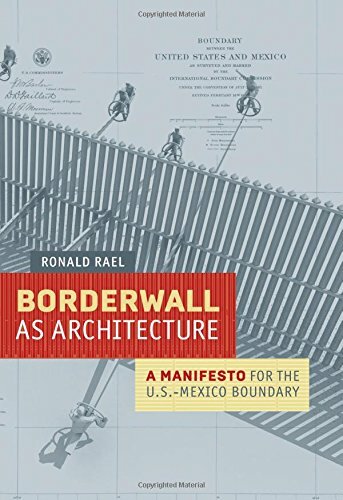 Unlike most architects who have refused to engage with borderwall design rejecting any appearance of complicity or opportunism, Rael sees endless opportunities for creative defiance as he exposes the wall’s xenophobic horror stories, absurdities and ironies by imagining design as both an undermining and reparative measure. Instead of fixating on the wall as a vertical obstacle, which, in any event is intended to slow, but not stop illegal traffic, Rael takes us on a conceptual horizontal journey along the US-Mexico border from San Diego-Tijuana to Brownsville-Matamoros. This is almost exactly the same distance (1,931 miles) as the Grand Tour, the coming-of-age odyssey for upper-class European men that extended from London to Rome. The original Grand Tourists returned from their travels with artifacts (art, books, pictures, sculpture) as symbols of wealth and freedom. In this Nuevo Grand Tour, Rael collects recuerdos (souvenirs, both mementos and memories) from a series of scenarios, real and imagined, he encounters along the wall’s actual and planned trajectory. In contrast, the artifacts collected here symbolize relative poverty and restriction. The bulk of the book is devoted to these recuerdos presented as a parade of vignettes, architectural drawings, projects and interventions, some satirical, some serious, all innovative and provocative, that shift seamlessly between history, developmental imaginings and dispatches from the frontier constituting a new design manifesto for the U.S.-Mexico boundary. Some of Raels’s more practical imaginings focus on a wall that serves public works needs while also improving security and improving quality if life by reducing pollution, supporting conservation, promoting renewable energy and promoting cultural interchange. A wastewater treatment wall along the Imperial Valley’s New River, the most polluted river in the United States. A solar farm wall, providing cheap renewable energy to power-guzzling southwestern cities. A hot water wall using the massive steel structure of some sections to heat water for distribution to hospitals, clinics and schools. A water collection system providing hydration for wildlife as well as illegal immigrants and others lacking potable water. A burrito wall with built-in infrastructure for food trucks providing seating on both sides of the wall so that food, conversation and culture might be shared, formalizing the existing illegal practice of cross-border social and commercial interchange through the fence. A lending library wall transforming the border into a binational bookshelf, encouraging cultural dialogue and information exchange through the wall itself. Even more whimsical suggestions include an art gallery wall, bicycle and pedestrian wall paths and a confessional wall with booths straddling the divide, along with a number of possibilities for binational cultural and sporting events conducted in tandem or in designated enclosed fields. And then there are the really absurd propositions such as a teeter totter wall, a swing wall, a xylophone wall and a climbing wall. The recuerdos are illustrated by numerous photographs of border locales, along with architectural plans and concept drawings sometimes overlaid on reproductions of the original 1882 plat of the U.S.-Mexican border or presented as key ring tags or under domes like snow globe trinkets in keeping with the tour souvenir motif. The remainder of the book is occupied by short contributions from four noted transborder scholars, but these serve mainly to underscore that the borderwall is a critical site of identity politics contestation and the imperative of finding new strategies for tearing it down. Rael’s voice is by far the strongest here and relatively free of postmodern architectural jargon.